Beautiful classics roam London’s streets. The sports cars featured in this video may not have drivers, but they are most definitely not autonomous cars in the sense we're familiar with. It’s a clever way of illustrating the sort of stock specialist dealership Hexagon Classics specialises in, however. 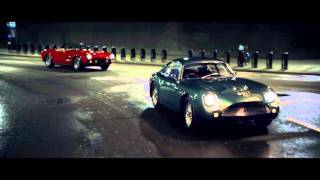 Called ‘Icons of the Road’, the video follows a series of cars – including an Aston Martin DB4 Zagato, Ferrari 250 GT Testarossa Spider, Jaguar E-type and Fiat Nuova 500 – as they slink through London in the dead of night. All, cryptically, without drivers. Much to the surprise of the driver of a 993 as an empty 356 pulls alongside and speeds off into the night. We’ve given up attempting to understand the thought process of the creative types behind videos like this, but it’s much easier to appreciate the metal itself – driverless or not, they’re the kind of cars to stop other traffic in its tracks. We just hope the buyers of such cars will see fit to use them as intended, rather than squirreling them away in a dehumidified cell somewhere far from civilisation, never to be seen or appreciated again. Current beauties in Hexagon’s stock include an Alfa Romeo 1900 Pininfarina Coupe from 1954, an exceedingly rare 1972 Ferrari 365 GTB 4 Shooting Brake, and a sleek Ferrari 512 BB, one of 101 right-hand drive examples built.